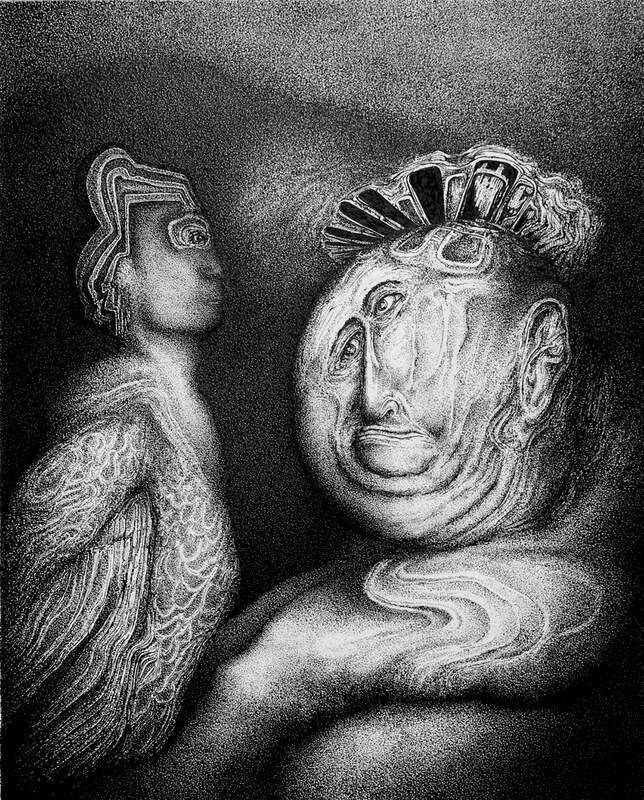 A pen and ink drawing “Grand Bird and the Cliff Dweller,” an example of previous work Dan Groth. 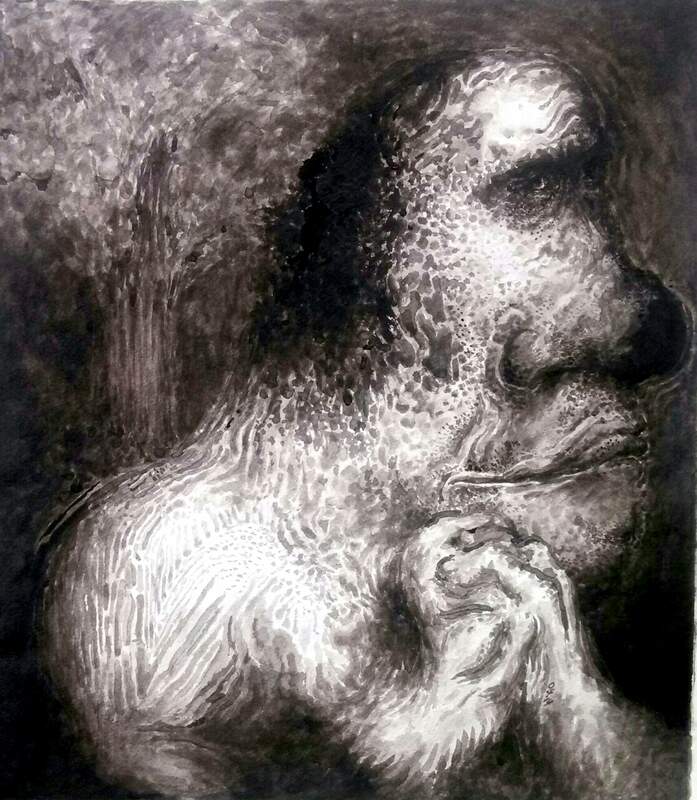 A pen and ink drawing “Hominid” by Dan Groth. When I moved back to Durango as a 35-year-old, I got yet another job in the food service industry, where I worked with mostly college students. I vowed to myself that I would be done with food service by 40 (which I just turned). I remain a part-time cook, but over the past few months I had quite the revelation in how I perceive my life: Art is now my career, while food service (or retail, or whatever) is just my job. To get to this point, I expended much time and effort into making and showing my art, but I recently made a big leap in reorienting my life toward deeper expression, most notably with a concerted effort to come to terms with my past through the means of artistic expression (be it visual, music or acting), to discern what kind of stories I tell about myself and how they affect my everyday existence, and how to honor my past (good and bad) while letting go of things I no longer need. As I’ve approach this art show, the key point of reference that ties everything together is that I began my lifelong practice of journaling on Jan. 7, 1994. As I entered that year, I was embracing my funkiness, finding a new identity as a more free-spirited outdoorsy creative type, and rejecting my previous TV-watching, Nintendo-playing, sports-guy life in a liberating sort of way. My journal started off with the mere recording of daily events, and sometimes trying to recall for posterity events that occurred before my start date. It began to expand my consciousness in ways I didn’t recognize at the time. Within a week or two of finishing my first journal, I read it front to back and continued to develop a notion of my own story. It was a wonderful time to be writing, with developing friendships with women, but the effect of my journaling, which had quickly become an integral part of my life, surely enhanced my perception of how good those times were. Looking back 22 years, I see that my budding outdoorsman/environmentalist identity at the time was part of a larger cultural zeitgeist – especially living in uber-outdoorsy Boulder County – and some of my zaniness can be attributed to the “freak flag” nature of ’90s alt-culture, which I’d embraced in my own way. But such is the nature of cultural evolution: We all participate in our own way, some more fully than others. I am not as consistent with daily writing as I was when I started, but journaling continues to remain a crucial part of my life, and will be so until I pass on. I have read all of my journals, many of them more than once, but an epiphany occurred this summer after I “confronted” a journal that I’d been avoiding. It was from exactly 10 years before, recording a time that had left a bit of a scar on my life. While reading it, I wrote commentary in a separate journal. It was emotionally taxing and I became concerned that I was dragging myself down into that terrible space. I was able to snap out of it with the help of friends, but it was a tough time. I am currently re-reading my first two journals – they are much lighter, joyful accounts – but as I see my budding sense of self-storytelling in those 22-year-old pages, I also recognize how much the story I developed in 1994 influenced how I came into dark times in 2005. There isn’t a straight line between 1994 and the present time, but I remain the same person with similar tendencies. We all have stories that we tell ourselves about ourselves, but sometimes we need to revise our stories, and that requires coming to terms with the more troublesome times in our lives, something journaling has allowed me to do.